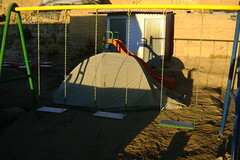 Camping in Latin America is different from camping in the US and Canada. There are no (or almost no) "official" campgrounds. It's really rare to see anything like that, and when you do, it's often more expensive than a hotel. And there is almost no "unclaimed" land, like in the western US or Canada. In the US and Canada, if you see a quiet place, you can just set your tent up there (if you're discreet) and nobody will ever know or bother you. In Latin America, almost everything is "owned". One time we set up discreetly behind a horse barn in a Mexican pasture right at dusk. Since we had run out of options, we just set up. We were immediately discovered. Some kids came and checked on us right away. Nobody bothered us, but we were not succeeding at hiding out. 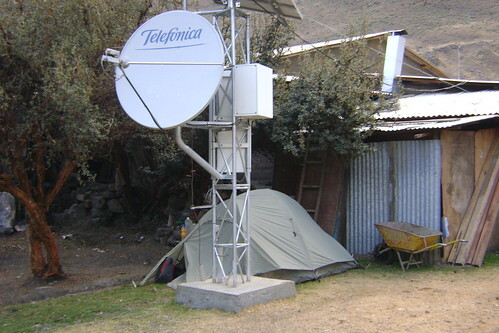 Another thing about camping in Latin America is the security issue. Any of the locals will tell you that you should never just camp along the road, especially within sight of the road. That makes you a sitting duck for crime. 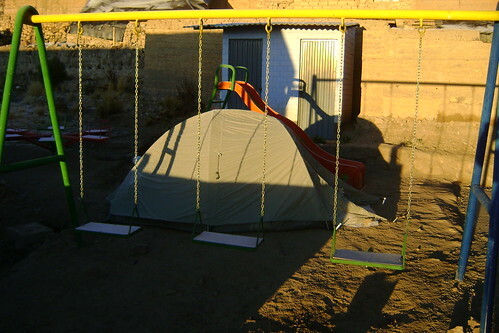 The locals will say that camping is fine, but you need to ask in a village or at somebody's house for permission, and they'll give you a safe place to set up. It's cheap and easy (if you get to a town that has one and you like what you see). In Mexico we paid US$10-15 per night. 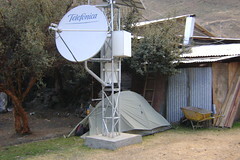 In Colombia, Ecuador, and Peru it's been more like $5-10 per night, sometimes with a nice room and cable TV. You get a shower, often hot. You get a secure place for yourself and the bike and gear. Sometimes your tent is a fancier place than some hotels you find. You make friends when you ask for a place to stay. All this said, we know lots of people who have camped almost all the time on their voyages, and have done it very happily. And we're camping more and more. Sometimes we're not making it to the next town, and lots of times the little hospedaje in the town is not really worth sleeping in, so it's a lot better to set up the tent. And we love sleeping in the tent. Is there a bathroom, or do you have to go out in the field? Is there hot water? Is there water? If so, when is it available and for how long? How many roosters are there nearby? How many cockroaches when you flush the toilet? Is there a good place to light up the stove? If Randy can't make the morning coffee for me, I might never get up! And most important, make sure there is no discoteque in the neighborhood (or the next neighborhood over), especially on weekends or holidays.